It's been rainy for a few days so today we're playing at 10:30. Weather nice and dry although chilly in the upper 40's to mid fifthties. My Tuesday blitz group got rained out yesterday so we are playing today at 11:00 . Temps will be close to 60 degrees today and then tomorrow the weather will be nasty for the next four days with temps dropping. Got to get er done today! Polar vortex, man. Polar freakin' vortex. It's 12 outside right now as I look at 2.5 inches of snow on the ground. To say I'm envious of those of you who get to play today/tomorrow/next week is an understatement. Cool weather golf - cannot wait! I hope it is a bit windy, keeps the fair weather golfer off the course. Perfect for light weight jackets today! Temps shot-up to 80* today! Winds were gusting around 30, but I got in 18! Playing today at 146. Its supposed to be in the mid 80's and breezy. Heading to the course at 10:00 this morning to play. Our Tuesday regulars decided to change our weekly blitz for today as it was too cold yesterday (In the high 40's). Today is heading towards 60 degrees so off we go. I'm thinking about getting out this afternoon. Frost delay til 11, figure it will take until at least 1 to clear the backlog. Yea I imagine our course will be stalled until the thaw too. I'm heading out early enough to chew the fat and then head over to the range and hit a few warm up shots. Playing again today and the weather will be at the 60 degree mark! We have two tee times beginning at 11:00 and this will be my last golfing until early next week. 52* today and wife talked me out of playing golf and instead went to lunch at a brew pub then did a brewery tour. Heck it will be warm again tomorrow. 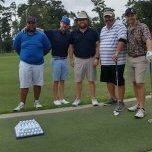 Get to golf quite a bit this week, Tuesday with my brother and one of our pastors, Wednesday with my brother and a good buddy, Thursday with a bunch of the MGA guys at Dormie club in Pinehurst, then next Monday the 2nd with the regulars. Hopefully my back will hold up, I will take it easy for the first couple days as those will be fun rounds just to play.